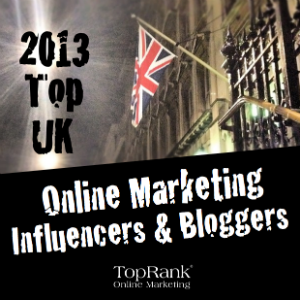 I was delighted to be featured in TopRank's Top UK Online Marketing Influencers & Bloggers in 2013. That's me down at Number 43. Its an impressive list - between the 50 of us we have 683,000 twitter followers and 15,000 facebook friends. But in the words of one of the judges, Allister Frost, "don’t pay too much attention to the relative placement on the list but focus instead on checking out those bloggers who write about stuff you find interesting. And if you like what these bloggers do, don’t forget to let them know and to tell others about your great discoveries." I couldn't have put it better myself. I've now made sure I'm following the entire list myself and am looking forward to being enlightened. Anyway thanks to the panel for voting me in. I am genuinely humbled.